There is this voice again telling us about the importance of keeping humor in mind at all times. Since I saw this sign I believe that also sign designers keep humor in mind even though the humor is some sort of wry. I'm not sure if I understand the sign correctly but I guess it is saying: Do not embrace the train! Aw, c'mon, don't be such a kill-joy! This is exactly what everybody wants to do, right? 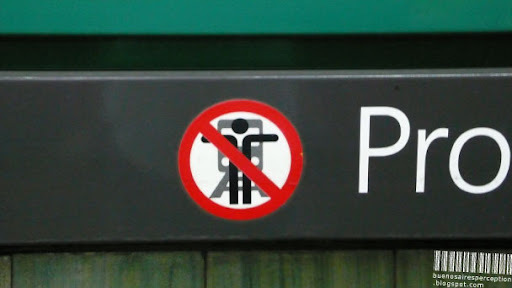 Kidding aside, I'm not convinced that someone who wants to jump off the platform can be stopped by a sign like this. In what way do you perceive this sign? Beware of Businessmen in Buenos Aires? Both of those signs are hilarious...and I agree, they're just incredibly difficult to interpret, especially at a glance, and I think signs are supposed to give immediate insight. There is a school for all potential bureaucrats - It teaches them obtuseness and befuddlement and how to pass it on! Obviously, you have some who excelled in their studies! Who knows: as Che Suicidio is deciding to jump, or not to jump, the signwriters wry humour may save him. Hug a train? Sounds crazy to me. I never knew people had those kinds of urges. It might as well say no hugging because it fails to say much else. They would be a laughing stock trying to use that sign here. I thought that sort of sign was meant to be used all over the world because it transcends language. This guy was about to cross the track but then he came across an old friend and just wanted to give him a big hug but didn't know a train was coming.